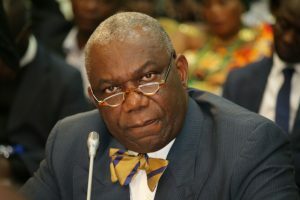 There is a need to establish new legislations for the downstream petroleum sector, in order to realise government’s vision of making Ghana a hub for refined petroleum products in the West African sub-region, Energy Minister, Boakye Agyarko has advised. According to the minister, who was speaking at the 2018 Downstream Colloquium in Accra, the current National Petroleum Authority (NPA) Act is deficient of some pertinent policy directions that are needed to revamp the sector. “The current NPA Act, 2005 (Act, 691), does not take into consideration the downstream petroleum sector’s transformation into a hub in the West African sub-region. “Government, through the Ministry of Energy and regulator (NPA), is taking steps focused on transforming the downstream sector from its present state toward achieving government’s vision of making a hub for refined petroleum products in the West African sub-region, and this goal may require the passage of new legislation and/or amendment of the existing ones,” he noted. He added that the new Act, when established, will encompass the hub concept which, among others, will incorporate ideas such as a licencing and permitting regime; realignment of the regulator’s mandate; construction and operation of downstream facilities; Tariffs and Charges for use of Downstream Petroleum infrastructure; financial transactions; and HSSE standards. “We have sent out various teams to look at all the other hubs that operate in the world – Rotterdam, Singapore, Malaysia – to study and understand how it is done properly. And I believe that in the not-too-distant future, you will begin to see the actual manifestation of these developments on the ground,” Mr. Agyarko said. He entreated all players in the industry to position themselves to make the most of emerging opportunities to transform the Downstream sector. Speaking on behalf of the Vice President, Senior Minister Yaw Osafo-Marfo advised the Energy Minister to recommend legislations which will make things easier for players in the private sector to operate. This, he said, will curb corruption and increase government’s revenue as businesses thrive. “We certainly want to be a significant player in the petroleum downstream industry in West Africa, and therefore we need to make it easy. Sometimes we tie our hands with our own legislations, which makes it very difficult for us to move. Legislations should not become bottlenecks for the future operations of the industry,” he urged. The Downstream Colloquium, which was attended by sector players, bankers and civil society groups, was organised by the National Petroleum Authority. Themed ‘Ghana’s Petroleum Downstream, Then, Now, and the Future’, it sought to engage industry players, policymakers and the general public to dialogue on the industry’s activities, government policy directions, investment opportunities and trends in the sector, to ensure continuous growth and development of the petroleum downstream. In his opening remarks, Chief Executive Officer of the NPA Alhassan Tampuli reiterated the Authority’s commitment to formulating and implementing innovative strategies and policies to ensure the industry remains efficient and profitable. “It is with this commitment that we have decided to create this colloquium series to initiate discussions that assess the Petroleum downstream industry,” he said. Mr. Tampuli also pledged his outfit’s resolve to continuously flush out unscrupulous operators in the industry to place Ghana’s Petroleum Downstream among the benchmark industries in Africa.